The local τm models and model-free models should not be modified, the reason for this is explained in section 7.8.2 on page . The grid search increments defaults to “11”. This is used in the optimisation of the individual model-free models for each spin. This value should also not be touched unless you know what you are doing (and have read d'Auvergne and Gooley (2008b)). The number of Monte Carlo simulations can be increased but, for accurate error estimates, it should not be less than 500 simulations. One additional setting is the “Maximum iterations”. This is a maximum number of times the protocol will iterate before terminating. This allows infinite loops to be broken. The value of 30 iterations should be fine for most analyses. 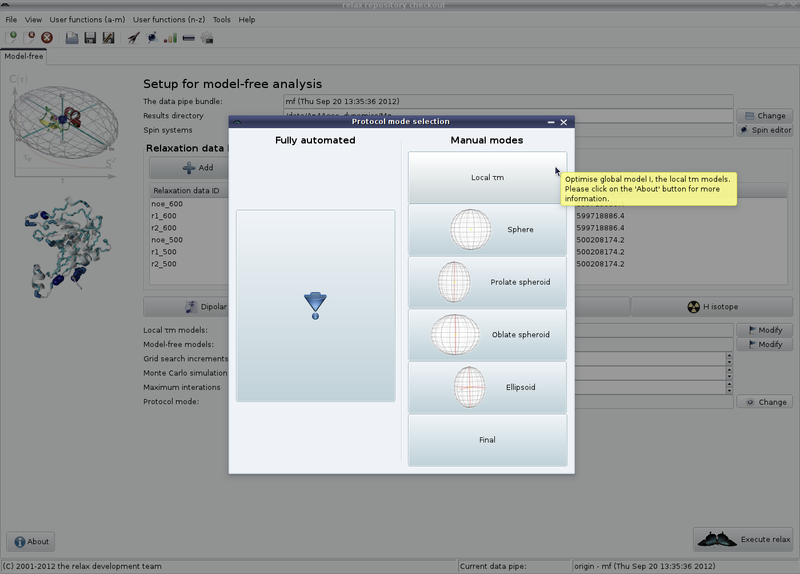 From this you can first select the “Local τm” model, then the “Sphere” and finally the “Final” mode, clicking on “Execute relax” between each selection.